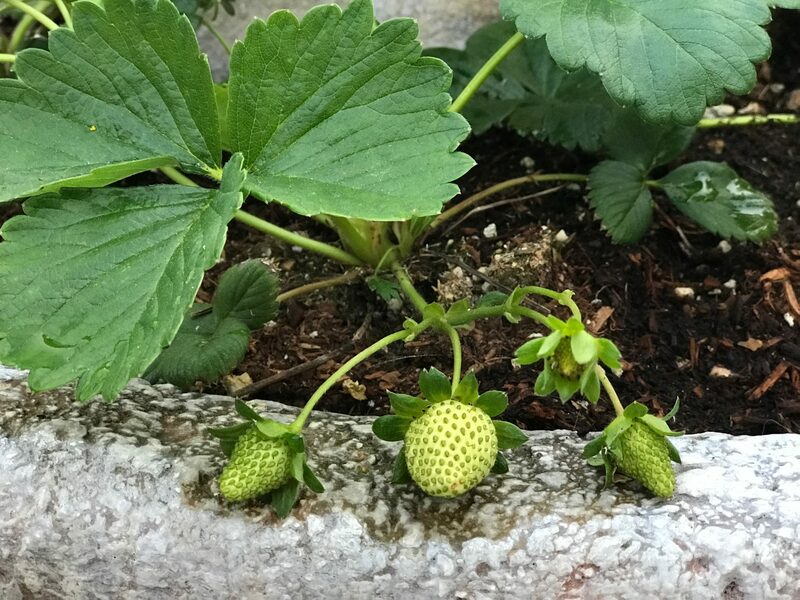 Nothing says spring has sprung more than when those first big, delicious strawberries start appearing in the market. 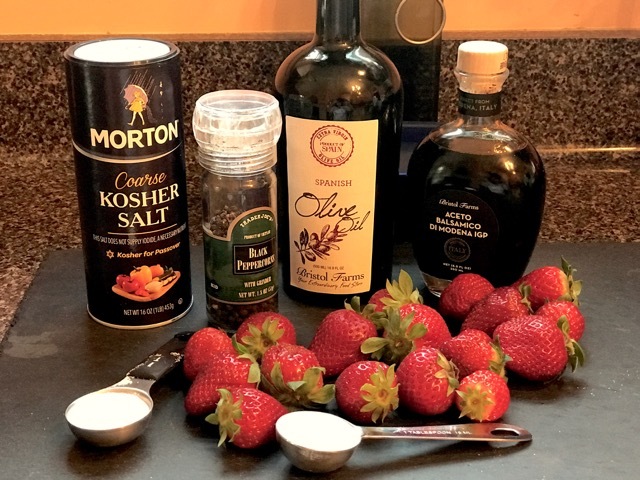 And, when I saw the strawberry vinaigrette recipe in Southern Living, I knew exactly what I was going to make for dinner. I dressed the salad up even more with the addition of some edible flowers from my garden. This dish could be the prettiest I have photographed! Peppery baby arugula is my go-to green of choice for salads. 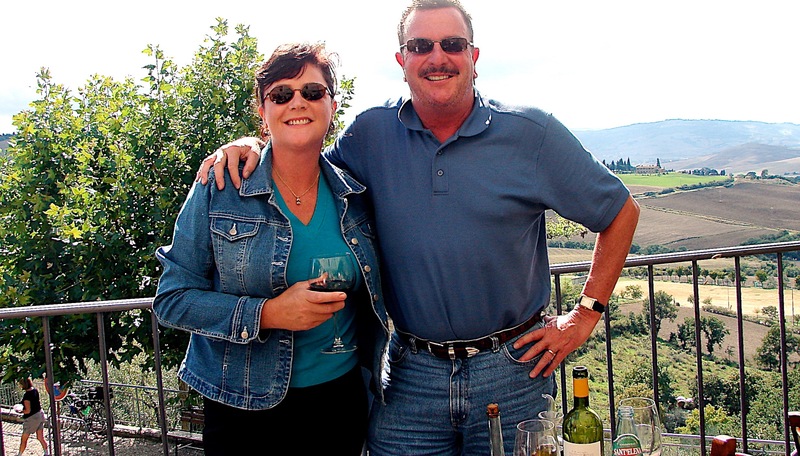 We first tasted this on a trip to Italy in 2005 where they call it rocket salad. On that day, they served it with walnuts, freshly grated pecorino and a drizzle of fabulous olive oil. Mamma Mia, I am ready to return to Italy! 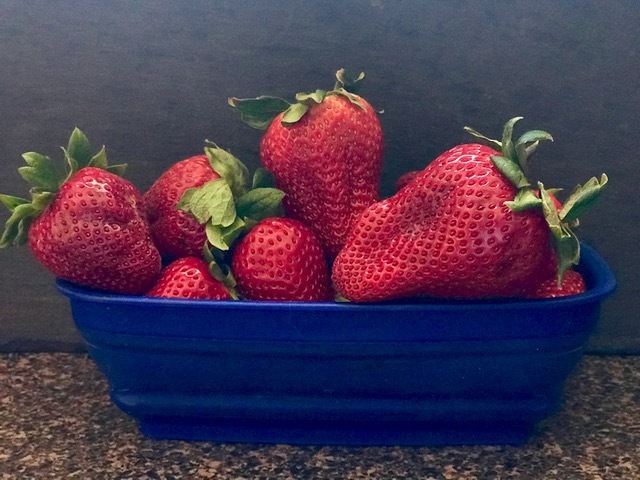 Tom hopped over to the Farmer’s Market and picked up a basket of the biggest, reddest strawberries he could find. 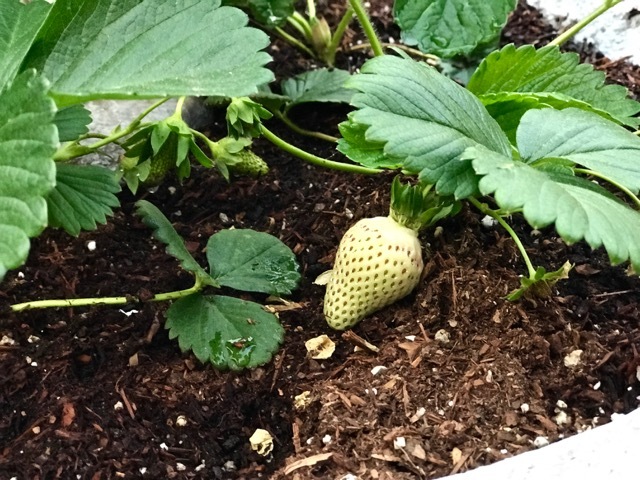 Ever wonder how many strawberries are in one of those baskets at the market? Long ago I read something in Fine Cooking that one pint of berries is (usually) equal to 12 oz. or about 2 cups when sliced. So, there you go, it kind of, sort of helps you calculate how much to buy. 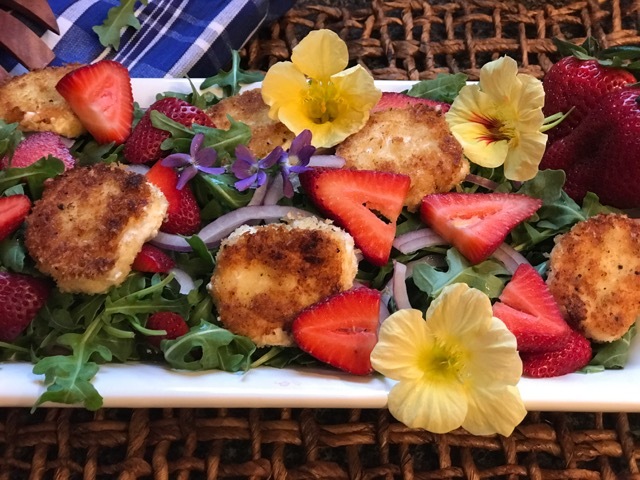 If you don’t have time to make the goat cheese rounds, crumbled goat cheese will do the trick, as will almost any other cheese that pairs with strawberries. I didn’t care for the dressing made with white wine vinegar, so I made it again with champagne vinegar and yet again with balsamic vinegar. We preferred the flavor of the balsamic dressing, but it does have a much darker color than the one made with champagne or white wine vinegar. A little trick I learned from the Barefoot Contessa is to use dental floss (yes!) to cleanly and easily divide the goat cheese log into slices. I hope you enjoy. Happy Spring! Slice the goat cheese into ½-inch thick slices. Place the panko crumbs on a small plate and mix in a couple of grinds of fresh pepper. 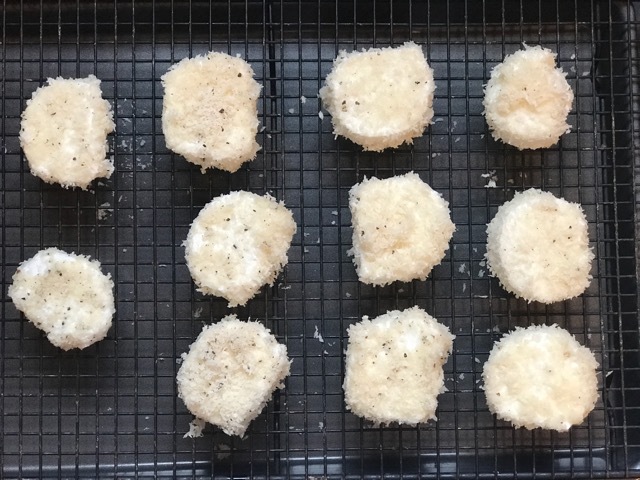 Dip each slice into the beaten eggs whites and roll in the panko crumbs to thoroughly coat. Place the breaded slices on a rack and chill for at least 15 minutes. Melt the butter and olive oil in a large sauté pan over medium-high heat. 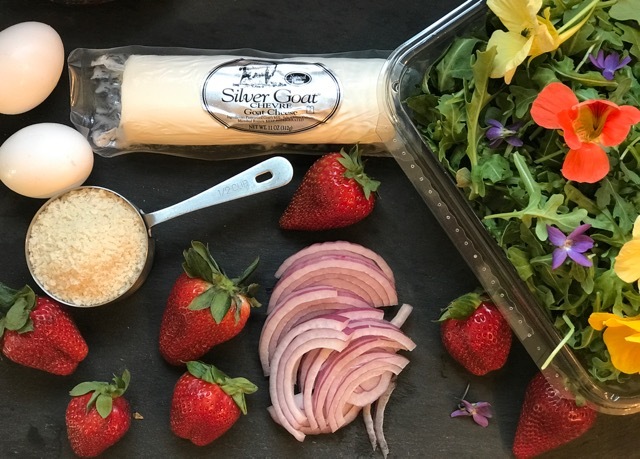 Cook the goat cheese rounds quickly on each side until browned on the outside but not melted on the inside (about 2 minutes per side). Remove to a paper towel-lined plate to drain. 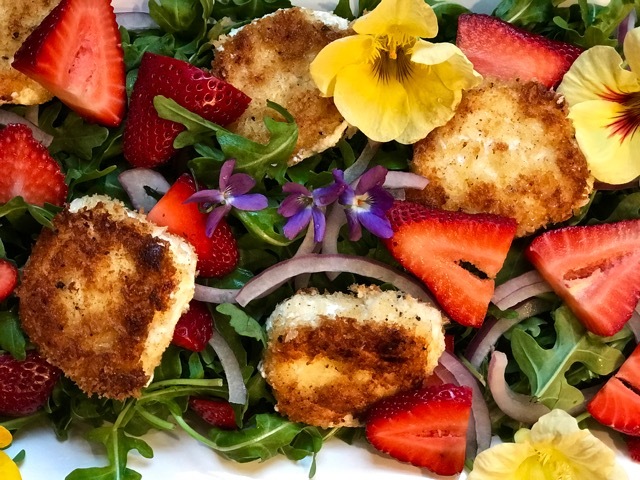 To serve, toss the arugula with the vinaigrette dressing and arrange on individual serving plates or a platter and top with the strawberries and red onion. Finish with the cheese rounds on top. Garnish with a sprinkling of edible flowers. 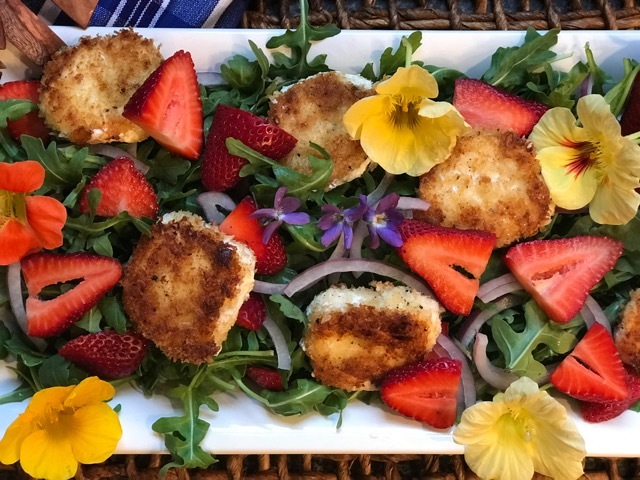 Recipe adapted from Strawberry Poppy Seed Vinaigrette, Southern Living and Salad with Warm Goat Cheese from Barefoot Contessa Parties!